Stop on over at Alyce's wonderful blog, At Home With Books, to get the links for all the other photos in this fun meme. If you aren't one of the participants, you can see the easy rules there, too-- and I hope you'll decide to join us! A small gathering in a glade. 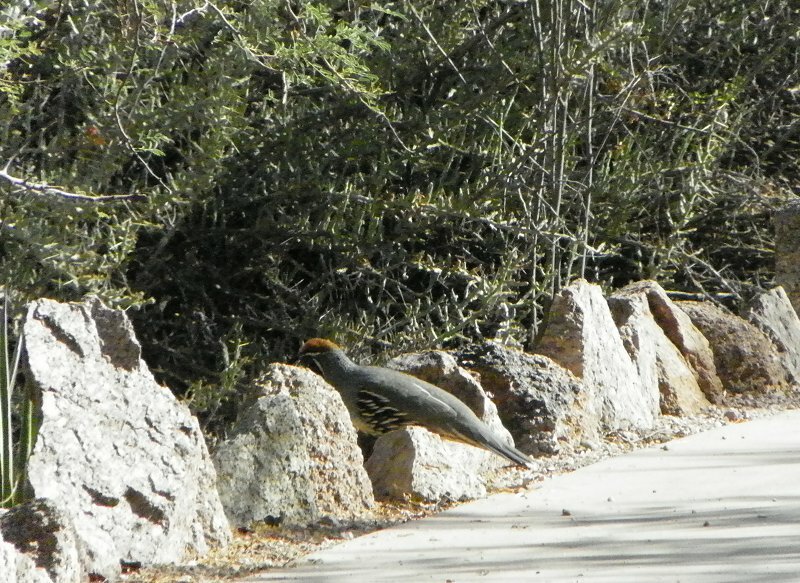 But usually you see one or two darting across the path in front of you. Ahh, I love the close-up shot. That is one beautiful creature, and a timely shot of him/her strutting his/her stuff! 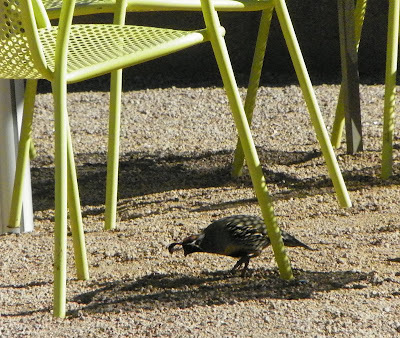 The Patio Cafe at the Desert Botanical Garden is the only place I've found Gambel's Quail that are willing to be photographed. Every place else I've seen them, they scuttle off so fast I can't get the camera focused! Cathy - You've got some wonderful shots here! I can see why that little guy belongs to your favourite species of bird. They have such personality! Thanks for sharing. I'm glad you enjoyed them, Margot. Oh, I love these - so sweet. Very nice photos - especially the bottom one! Great shots! They don't seem to mind being photographed. They don't mind if they're at the Patio Cafe; otherwise, they're some fast-moving little birds! Very cute. 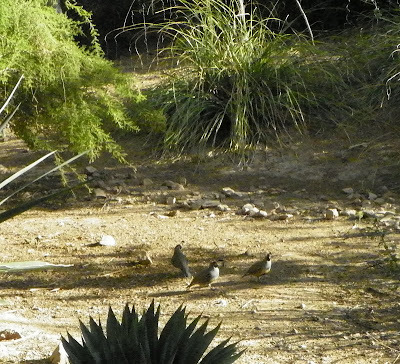 They look like miniature versions of the quail we see here. I love how a male will sing its heart out trying to gather as many females to him as possible. My husband and I have a home in New Mexico although unfortunately we still live in New Jersey...we're working on it! Anyway, when we're in NM we often see the Gambel's quail crossing the road. They are such neat birds! Have a great day! You, too-- and good luck on your move to New Mexico! I like how you led up to the close-up! A quite interesting-looking and pretty bird! I'm glad you enjoyed the progression of shots, Alyce! They look like friendly little guys. We have Bobwhites here in the east and they do that little darting across the road thing too. But they never pose for photos! I was shocked and amazed that that one male at the Patio Cafe posed for me! I love the Desert Botanical Garden. I wondered what those birds were! 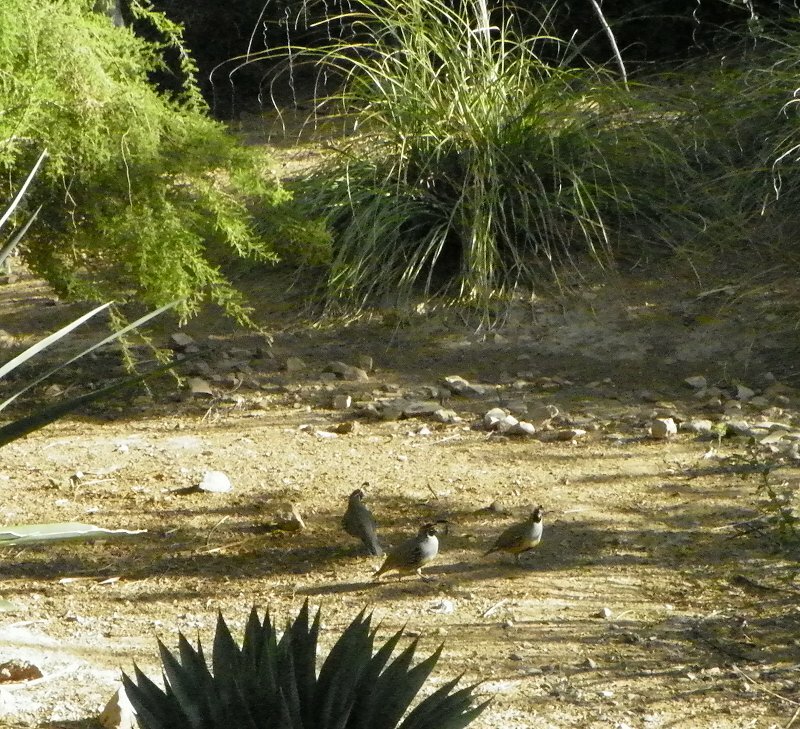 I guessed some sort of quail but they sure look different from our bobwhites. I grew up with Bobwhites, and these are very different birds. I've been trying for years to get a decent shot of one, so I'm very appreciative of that little guy! I love how they bob when the male does that little running walk of his. 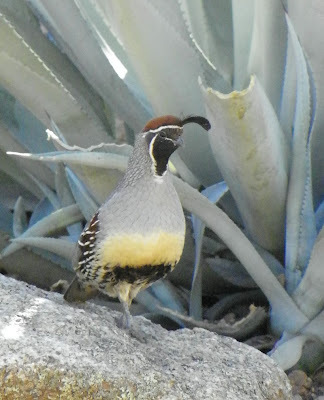 Quail are wonderful birds. Love to see them run! So do I. They have quite a turn of speed! What a great looking bird! I love that crest.